Addresses. Visisted Mrs [Neome?] June 15th Mrs. Shrank Robbins gave me a call. Mar. 19th. I was there awhile June 4th Mrs M Slone called when passing this A.M. finding me at Mrs. B_'s May 25th Miss Robbins with her Bro. Eq's wife in awhile after tea. May 28h returned Sept. [14th?] 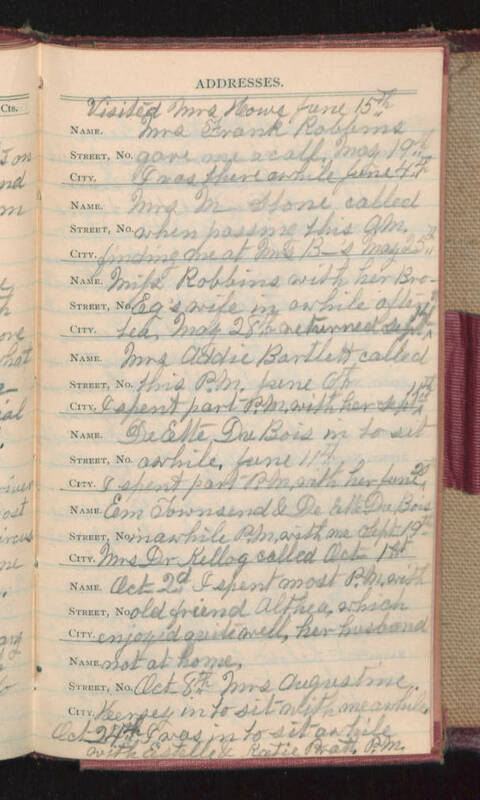 Mrs Addie Bartlett called this P.M. June 6th I spent part P.M. with her Sept 15th DeEtte Du Bois in to sit awhile, June 11th I spent part P.M. with her June 20 Em Townsend & De Ette Du Bois in awhile P.M. with me Sept 19th Mrs Dr Kellog called Oct. 1st Oct 2d I spent most P.M. with old friend Althea, which enjoyed quite well, her husband not at home. Oct. 8th Mrs Augustine. Kersey in to sit with me awhile Oct 24th I was in to sit awhile with Estelle & Katie Pratt. P.M.